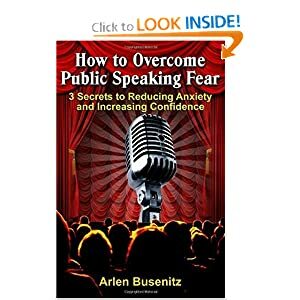 How to Overcome Speaking Fear by Arlen Busenitz is an easy to read, easy to understand, and easy to apply guide for the reluctant public speaker. Public speaking can be a terrifying prospect to many people and Arlen tackles this fear head on. His three steps are great for the reducing the inevitable butterflies that come when standing in front of a crowd. Public speaking is an art that is improved with practice, but not all of us get much practice and this guide gives great advice for people who are new to speaking in front of others. For me, I really enjoyed the practical tips in the bonus section of the book including how to prepare powerful speeches and the greatest public speaking secret. Thanks for a simple and easy guide to this common issue of fear that we all face!